The principle literary resources in the study of Spiritism are 5 books published by Allan Kardec, which comprise what is known as the codification of Spiritism. 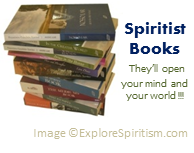 Since the publication of these books in the mid 19th century, numerous complementary works have also been added to the collection of resources available to students of Spiritism. These complementary books are written by both incarnate and discarnate authors, and they fall under a variety of genres. Whether they are scientific studies, philosophical explanations, biblical interpretations, educational narratives, recounting of personal experiences, or inspiring and motivational messages or teachings, all these books share in the common goals of helping us to understand our true spiritual nature and encouraging us to seek out a continuous inner transformation. Click on the button at left to browse through images and descriptions of books presently available in English and find out where to buy them.